Anyone planning to visit Amsterdam should definitely learn more about the city before arriving. Use this Amsterdam travel guide, along with my posts on where to eat & stay in Amsterdam and fun things to do in Amsterdam, to plan your trip. Discover the best times to visit and what you should bring on your trip to Amsterdam below! What's with The Weather in Amsterdam? I'll admit it: my judgment about our trip to Amsterdam was clouded by the weather (pun intended). We went in February, which is traditionally cold (30-40 F, 0-8 C) and wet! We hadn't necessarily planned to go to visit Amsterdam in February, but we simply couldn't pass up the opportunity to see Amsterdam for less money. Based on my research, I expected some showers and frigid temperatures during our trip. So, I was somewhat surprised when it rained every single day we were there. Even the novelty of my brand new raincoat and rain boots wore off by the third day of constant rain. Now don't get me wrong: running through the historic streets of Amsterdam is beautiful no matter what. But it's a bit harder to appreciate the beauty of your surroundings when you're constantly looking down to make sure you're not about to slip and fall. I was hoping for a few days filled with sunny skies and windmills. Turns out, March through May is the best time to go for tulips, while summer months (June through August) are the best for warm, sunny days. But, of course, those are the peak tourist seasons, so be prepared for queues. Although the weather definitely made it hard to love Amsterdam, I did make some great travel memories during my Amsterdam adventure. 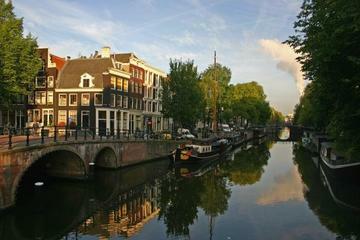 And contrary to what you might believe, I AM encouraging you to visit Amsterdam to experience it yourself. I just want you to be prepared for rain. So, I've read that it rains nearly year-round in Amsterdam. Granted, the summers are supposed to be spectacular. Still, it doesn't hurt to be prepared. Rain gear is essential in Amsterdam, especially if you are visiting during the winter months. Be sure to bring a waterproof jacket (mid-weight) with hood, waterproof shoes, and travel umbrella. You'll also want warm socks and a cozy knit hat if visiting in the winter time as we did. Getting caught without these things could ruin your trip. Now, if you've read anything about me, then you know that one of the main reasons I love to travel is to take photos. What I find surprising about Amsterdam is that I have so few photos from my time there, at least when compared to the other Dutch cities we visited. It turns out that I hadn't properly planned for shooting a city in the rain. Can you imagine trying to take photos while holding an umbrella? Although my Pentax K-3 DSLR is weather-sealed, it's not water-proof. So, taking my camera out in the pouring rain would have been ludicrous. I found it hard to get the shots I wanted in the rain without the proper gear. Fortunately, I was able to snap a few shots here-and-there between showers. But, after a while, I stopped even bringing the camera along on excursions. Even The Professor noticed this highly unusual behavior. Looking back, I wish I had prepared for the rain by bringing some essential gear for shooting in bad weather. The transportation system in Amsterdam was quite good despite the fact that the city is essentially a series of islands. No car rental was necessary as there are abundant alternative transportation options in Amsterdam. One popular transportation option in Amsterdam is the bicycle. Everywhere you look there were rows and rows of bikes. There are so many cyclists that pedestrians have to be careful. If you don’t pay attention, you may get run over by a speeding cyclist! Renting a bike in Amsterdam is a breeze, just be prepared to peddle! The bus system in Amsterdam is another popular means of transport. One hour tickets can be purchased from the driver, or you can use your iAmsterdam City Pass for unlimited public transportation for 24, 48, or 72 hours. The ever popular Hop-on-Hop-off buses are another fun way to see the city! In addition to the bus system, Amsterdam has a network of trams, trains, metros, and ferries. The convenience and ease of use of the transportation network makes navigating Amsterdam a breeze. All our encounters with the Dutch in Amsterdam were helpful. We found the people to be quite friendly and eager to help give directions, suggestions, and recommendations. One of the things I remember thinking while in Amsterdam was how similar everyone looked. The population seems to be very demographically and economically similar. Everyone appeared very industrious, hard working and smartly dressed. Another thing that struck me was the lack of vagrants. Living in Los Angeles, I've grown accustomed to seeing a large number of homeless people. I honestly don’t recall seeing any vagrants, even any shabbily dressed folks for that matter. One can only hope that was a testament to the Dutch social welfare system and not just simply where we were located in the city. My mission in Amsterdam was to answer one question: Does Amsterdam have more to offer travelers than prostitution, legal drugs, and all-night dance parties? 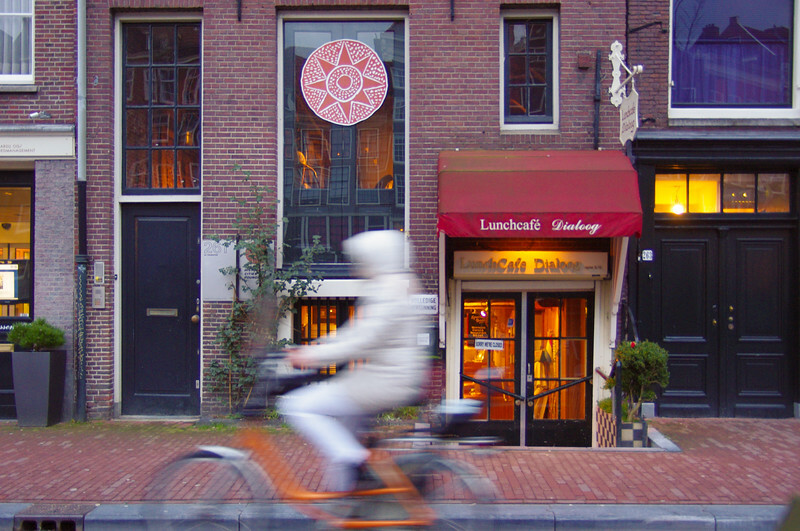 I couldn't very well write a post about Amsterdam without mentioning my thoughts on cafes and the Red Light District. Yes, we walked past both but didn't partake (pun intended) in either. Now don't get me wrong, I'm not bothered by the cafes. But I can definitely see why some people might be. You can expect to occasionally get a whiff of marijuana while walking through the city streets, something I'm sure travelers with children might not appreciate. While the cafes may attract a certain kind of visitor, it seems like they may also alienate others. But the Red Light District was appalling for many reasons. My Social Worker heart bled for the women in the windows. It was devastating to see the tourist ogling them and snapping photos. It reminded me of visiting a zoo. Only there were human beings caged behind the glass instead of animals. It was vile and disgusting to see, at least in my opinion. Don't Miss My other Amsterdam Travel Guides! Would visit Amsterdam again? Absolutely. That is If the weather’s better. I know traveling during the off season is preferable (less tourists, cheaper, etc), but the price we paid was high. Our enjoyment was dampened (again, pun intended) by the weather. We spent the entire time tromping around in rain boots with umbrellas, dashing under awnings to avoid sudden showers, and avoiding the outdoors altogether. At times we were so soaked and chilled that we found it hard to leave the warm, cozy quarters of our modern digs in Prinseiland. We also both suffered from terrible jet lag during our time in Amsterdam, and I'm convinced that the weather played a role. And long naps in the rainy afternoons made for long sleepless nights. It was a vicious cycle we couldn't break in our short trip. But, there were many things I really enjoyed about Amsterdam. I've talked already about the food, museums, and city streets. I also really loved the busy, urban feel of the city. It's definitely the type of urban environment I like. I'm sure the city is amazing during other seasons, and I can't wait to visit again. Maybe I'll go for the great tulip bloom! Like this post? If so, then don't miss my other travel articles! Sign up for weekly updates in your inbox. Or follow me on Instagram where you'll stay up-to-date on all my content. Tune into Instastories while you're there to get a glimpse inside my crazy life in Cali. Thanks for all your support. It means the world to me!